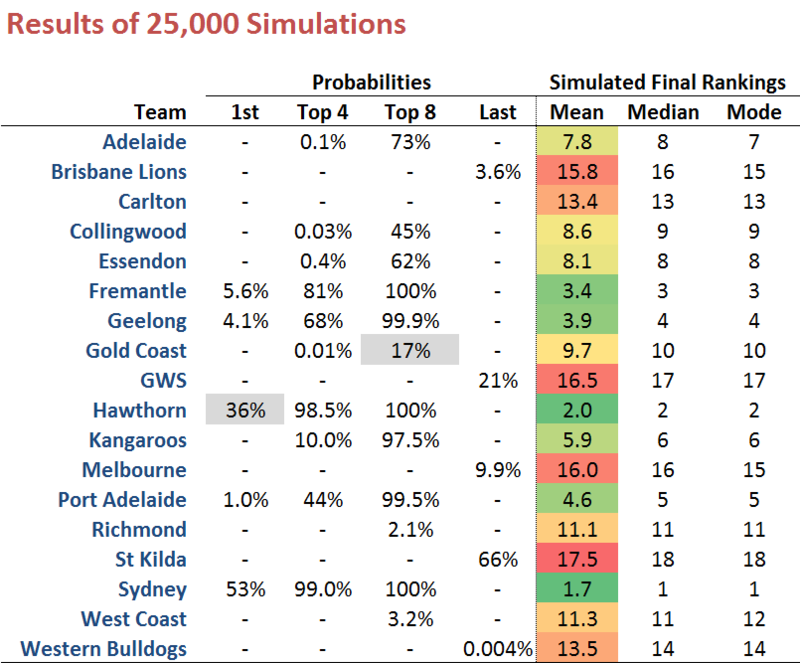 It seems now fairly likely that the final positions within the Top 8 in Season 2014 will be decided by a combination of percentage and games won, so I've this week had to amend the approach I've been using in my simulations from years past to allow for this reality. Then, selected at random a predicted final home team victory margin assuming that it too were drawn from a Normal distribution with a mean determined from current Team Ratings and the simple model described in this blog, and with a standard deviation of 36 points. The means used to create those simulated final margins are as per the table at right. Combined, the simulated outcomes for each of the remaining contests this season have been used to calculate the final Win-Draw-Loss and for-and-against data for every team, the results of 25,000 such simulations being summarised in the tables and charts that follow. These simulations show that Sydney remains as the team most likely to finish as Minor Premiers, though they're not as likely to do this as their current TAB Bookmaker price might imply. Again this week I'm providing this same simulation data via a heatmap for those who find this a better way to understand the simulated results. Sydney, in fact, finish as Minor Premiers in 53% of the simulations, which is insufficient to attach a positive expectation to their $1.50 TAB price. The same is not true, however, for the Hawks' 36% simulated Minor Premiership chances and $3.50 TAB price, which together imply a healthy 27% positive expectation. Broadly speaking, it's Sydney and Hawthorn to contest 1st and 2nd, Fremantle and Geelong to contest 3rd and 4th (with Port Adelaide potential interlopers), Port Adelaide and the Roos to arm-wrestle over 5th and 6th, and Adelaide, Essendon and Collingwood to draw straws over the two remaining Finals berths.